September 24 through October 12, 2013. This cultural undertaking between local artists and Saanich community groups has grown in size over the past four years. Held on the traditional lands of the Coast Salish people, the show includes a variety of Indigenous cultures and types of artwork: carving, weaving, prints, jewelry, pottery and leatherwork. Stories, music and demonstrations will enliven the changing displays of quality art. carving and education, the artist has worked tirelessly to revive Coast Salish culture. Charles communicates his knowledge by teaching in the classroon, and mentoring emerging Indigenous artists. His masks, carvings and prints are collected internationally, and his House Posts grace local venues such as Thrifty Foods Saanich, Victoria Airport, Mary Winspear Centre and the University of Victoria. “Quanus”, limited edition print by Charles Elliott. Well know as a print-maker, Charles holds “Quanus” which tells the story of a special place on Tsartlip were Hagan Creek empties into Brentwood Bay. In the tidal pool, fed by a waterfall, an Orca visits, blue herons fish, salmon leap and trout swim. Sananus is the traditional name of the island seen in the distance. “Ancient Design Spindle Whorl” by Charles Elliott. “Swan Table” by Chas Elliott, acrylic on yellow cedar with glass top. “I wanted to something elegant, beautiful and useful,” Chas says. The traditional Salish shapes of circles, ovals, crescents and darts animate the feathers and body of the swans. “Swan Table” by Chas Elliott, acrylic on carved yellow cedar with glass top. “Thunderbird Box” by Chas Elliott, acrylic on carved birch, 2013. Chas Elliott is the son of Myrna and Charles Elliott. At 17, he knows that carving will always be part of his life. The legends that animate Coast Salish artworks resonate with Chas. The Thunderbird is a gigantic winged creature with supernatural powers, found in legends throughout North America. The bird’s head is on the lid and the wing feathers wrap around the sides. The human figure seen on the front of the box, on the thunderbird’s chest, represents the human aspect of divine energy. On this birch box, Chas sketched out a thunderbird design. Then he used a series of palm chisels, (small straight knives) to pull or push away the wood. Acrylic paint in white and black finished the box. Lindsay Delaronde is professional practicing artist, living in Victoria. She completed her BFA at Emily Carr Institute and her MFA at UVic. Museum of Contemporary Native Arts in Santa Fe. Raised on the Kahnawake reservation in Quebec, her background is Iroquois and Mohawk. 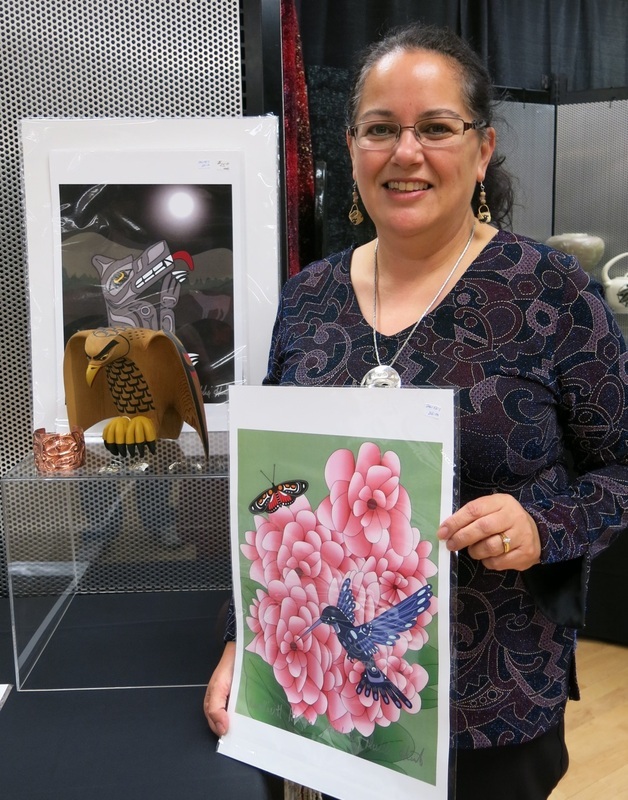 Her latest work, “War Canoe Paddles” is on exhibit at Kahnawake. paint on canvas, silkscreened, pony beads, 2010. 36in x 48in, Acrylic on paper, silkscreened, 2009. "Where and how we live our lives" is questioned in this series. The subject (Lorraine) is an Indigenous woman who lives outside the system in Victoria. The theme is multi-layered: Tammy Wynette’s song of the same name, deals with domestic violence and loss of family. Yet the artist gives Lorraine an aura of resilience and adaptability through confident colouring and monumental size. Traditionally, women made baskets, but in this urban contemporary scene, Lorraine’s basket is a shopping cart. The intention of the artist is to forge a new understanding of contemporary Indigenous realities, while embracing the wealth of her traditional culture. Lindsay Delaronde uses bold colours and large format imagery to convey power and pride. The artist draws great inspiration from the works of Andy Warhol, admires George Littlechild’s vibrant palette and the performance art of Rebecca Belmore. She intends to use her artistic gifts to become an art therapist. Carver Lionel Samuels was born in Massett, Haida Gwaii, into a well-known family of artists. His works are in collections worldwide, Including the Glenbow Museum in Calgary, the Burke Museum in Seattle and the Haida Heritage Centre in Skidegate. Lionel Samuels with pipe and carved argillite bowl. Lionel is looking forward to sharing his work with local audiences at the upcoming show and sale. 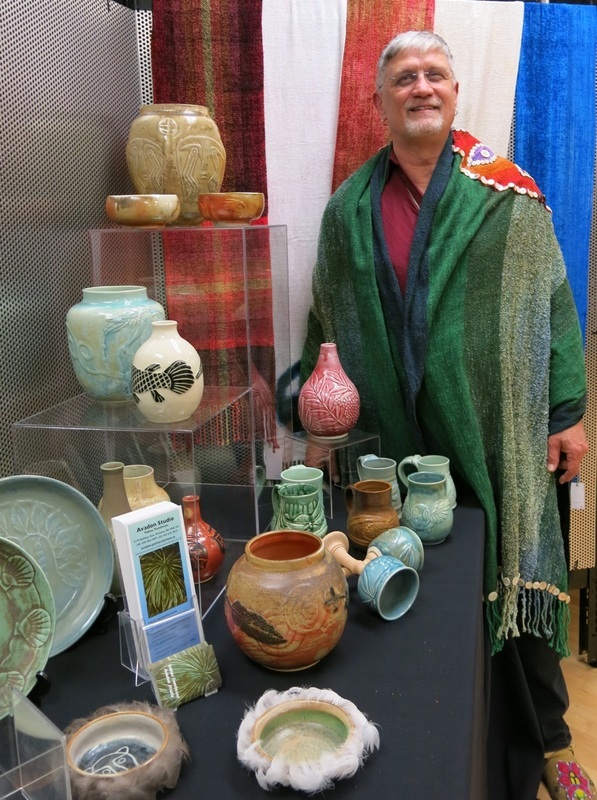 He recently returned to Victoria from a potlatch in Haida Gwaii. His argillite sculptures of mythological creatures show meticulous attention to detail and fluidity of form. Argillite is compressed organic matter, a rare form of slate, known to exist in only one quarry in Haida Gwaii. Shark carving by Lionel Samuels in argillite. The Shark is helper to Wasgo the Great Sea Wolf. Lionel points out the scales on the body - done in traditional Haida style. The teeth and eyes are made of ivory and the inlays on the body are abalone shell from New Zealand. “The black rock is quite soft and powdery,” says the carver, “and the special tools I use are handmade". The frog (the pipe’s bowl) and the snake (pipe’s body) are natural enemies, explains the artist, but combined they are powerful allies melded through ceremony. The argillite bowls of these traditional pipes are carved by the artist. In times past, rivals would reconcile their differences through rituals to gain strength from new alliances. Selena Aurica Bondoc is a talented self-taught beader and jewelry maker. 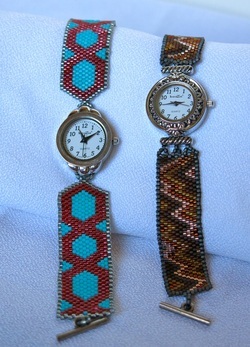 Inspired by nature’s patterns, she skillfully weaves colour harmonies and contrasts into her beadwork. Selena’s heritage is Colombian, Métis and Cree. Her business motto is Mindful Creations - One Bead at a Time. Currently working as a jeweler’s apprentice, Selena is excited to present new pieces at the show. Her elegant necklaces feature moss agate circle beads combined with peyote stitch beaded rings. The loosely-woven chain is argentium, a non-tarnishing silver, with a special clasp that allows for adjustable lengths. For people who say: “I love your work but don’t wear jewelry” Selena has created framed miniatures. Using peyote stitch beading, she renders butterflies and seascapes in exquisite detail, mounted in 8x10 frames. Circle stitch beading created the lovely necklace, bracelet and earrings set at right. The beaded chain has fresh-water pearl accents, and can be draped around the neck in various ways. Selena is happy to make custom orders for customers. September 24 was an exciting day at the Mary Winspear Centre. Eager guests arrived early and sales were brisk at the First Nations, Inuit and Métis Art Show. The opening ceremonies featured prayers, songs and words of praise for the hardworking organizers of the well-attended event. Photos of several of the artists at the event follow. The show continues until Oct 12, with ongoing demonstrations by artists and new works arriving daily. Tobias Tomlinson works in a variety of media through Avadon Studio. www.islandartisans.ca. Debbie Hunt is a Northwest Coast Artist creating jewelery, sculpture and prints. www.debbiehuntdesigns.ca. Dawne Burron uses sculptural techniques and natural fibres to explore her Métis roots. Virgil Sampson has many years experience making drums, prints and mandelas. Via sales at the inner harbour he connects with a world-wide audience. These medallion carvings by Kevin Daniel Cranmer are exquisite reproductions of ceremonial masks. This private collection is on loan for the duration of the exhibition. Kevin Daniel Cranmer. Photo courtesy Coastal Peoples Fine Art Gallery. Stephanie Papik operates Knotty by Nature Fibre Arts with her husband Ryan Davis. She mentors Aboriginal youth for the provincial government. Stephanie uses leather, fibre and fur to create unique utility belts. Wilbert Papik is an Inuit artist and educator. The two white drums above his head are hand steamed and bent white ash, covered with ripstop nylon. 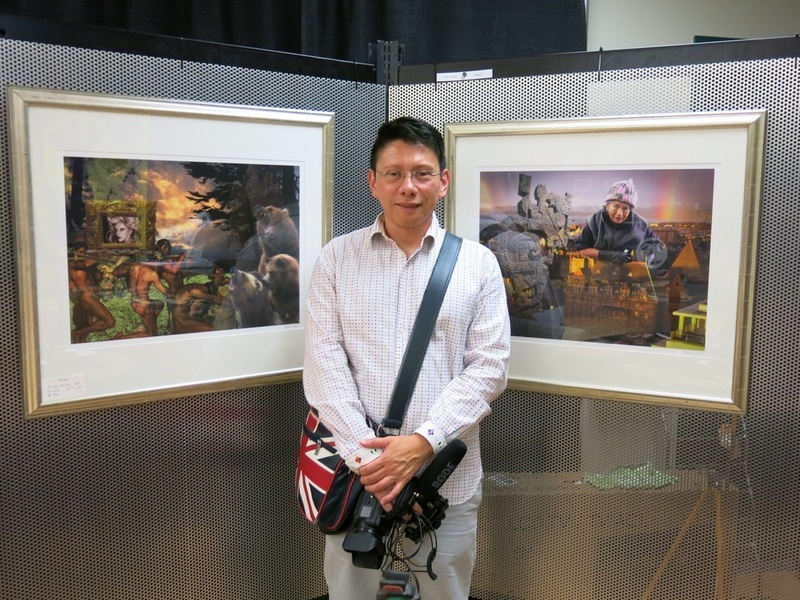 Efren Quiroz operates Exhibit-V, promoting local artists through video and reviews. Born in Mexico, his Indigenous heritage informs his photo collages. Doug Lafortune’s carving career spans four decades. His prints and sculptures show precise detail and energetic flowing linework. Kate Cino previewed arts events for 18 years at Boulevard magazine. She has a History in Art degree and Public Relations certificate from the University of Victoria. Kate Cino with Efren Quiroz from Exhibit-V.